The Kanban Kick-start Field Guide is a practical guide to help you kick-start your team into using the Kanban method for knowledge work, as described by David J. Anderson. It gathers the experience from introducing Kanban to 100+ teams at Sandvik IT. The Field Guide was written by two lean/agile coaches, Christophe Achouiantz and Johan Nordin, for Sandvik IT. Sandvik IT being rather large, the context is "the Enterprise", though the experience in the guide can be used in other contexts. Why do you make it available? We want feedback! We believe that we need the wisdom of our peers for the Field Guide to become great. While we are quite pleased with the current version, we know that it can be improved further. Perhaps you have some insight, experience and knowledge that would make the Kanban Kick-start even better? We want to hear from you! So this is not a definitive version? No. We plan on updating the Field Guide based on the feedback we get from the community. 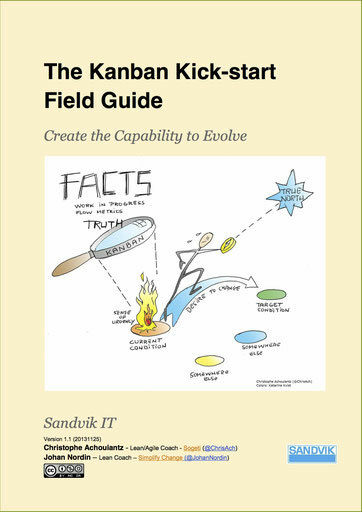 The Field Guide is already alive within Sandvik IT where it is used to spread knowledge, help new coaches and document the standard way to start with Kanban. Is it some new method / framework / process? No. It simply describes a practical way to introduce Kanban, especially when you have limited coaching resources and limited time from the team. It describes is a one-day workshop to get the team started with Kanban. It is down-to-earth practical with a step-by-step approach that anyone with Kanban experience can easily follow. It is centered on the team and for the team. The goal is for a team to quickly get in control so that it can improve. So, I just need to follow the recipe? No need to think? No. The steps are simple, but they are designed to challenge the team - and the coach - to really grasp the team's current condition. A good kanban system can only be designed when truly understanding a team's situation. Yes. The field guide is released under a Creative Common license Attribution-NonCommercial-ShareAlike 3.0 Unported. This means that you can copy, distribute or transmit and adapt the work freely. Though, you cannot use it for commercial purposes and you must attribute the work to Sandvik IT, as well as use the same or similar license if you alter, transform or build upon this work. How do I get the Kanban Kick-start Field Guide? It is available as a free PDF from here. Don't you have a ePub version or similar available? Not. We use many tables in the guide and they do not come out quite well in ePub. I have some questions, feedback, contribution, issues. How do I contact you? You can start by leaving a comment on this blog. You will also find detailed contact information in the Field Guide.